(Nanowerk News) A recent paper by researchers at Northwestern University in Illinois provides a physical explanation for the phenomenon wherein the backscattering of light by dielectric particles of sizes between 100 and 1 nm is enhanced by 7–11 orders of magnitude. The findings were published in Optics Letters ("Superenhanced backscattering of light by nanoparticles"). Vadim Backman and his group together with co-author Allen Taflove, previously discovered an optical phenomenon called photonic nanojet. These nanojets do not involve evanescent fields and do not require mechanical scanning. "None of currently available techniques allow non-destructive, quantitative, and cost-effective characterization of individual nanoscale structures with nanometer precision"" Backman told Nanowerk. Instead, nanojets are a local field enhancement generated in the vicinity of a microsphere or microcylinder illuminated by a collimated light beam in the visible wavelength range. 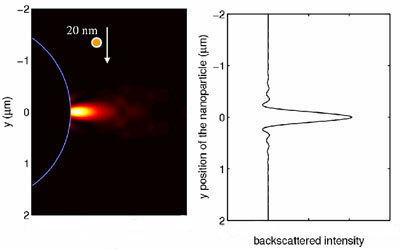 A remarkable property of these photonic nanojets is that they can significantly enhance the backscattering of light by nanometer-scale particles as small as ∼1 nm located within the jets. There appears to be a novel physical mechanism at work which yields this giant backscattering enhancement. "We are all surprised that even the nanojet itself was not calculated until our work, even though Mie solutions to the sphere have been available for literally many decades" Taflove comments. "This enhancement effect is an intricate physical process where several mechanisms are involved"" says Backman. Furthermore, the intensity and angular distribution of the backscattered signal is extremely sensitive to the size of the nanoparticle, which may enable differentiating particles with accuracy up to ∼1 nm. The unique variation of the nanojet with the size parameter of the nanoparticle was yet another big surprise, according to Taflove. These properties of photonic nanojets make them an ideal tool for detecting, differentiating and sorting nanoparticles, which is of immense necessity for the field of nanobiotechnology. Says Backman: "The photonic nanojet may have significant broad impact on nanotechnology and biotechnology. It maybe utilized for 1) analysis of individual nanometer scale intracellular components and macromolecular complexes and detection of individual viral particles; 2) detecting and characterizing individual nanostructures; 3) real-time sorting of nanostructures for the purposes of nanofabrication." Xu Li at the Biomedical Engineering Department and Zhigang Chen from Backman's group were major contributors to this work.